Tree Removal Troutdale | Mr. Tree, Inc. When deciding if you need tree removal in Troutdale, you want to consider not only whether the tree should be removed but also ensure you get stump removal and that the tree and all the debris will be hauled awayc. You also want a company with the right equipment and experience to ensure the safety of all individuals, structures, and other trees and foliage in the area. Mr. Tree, Inc. has been a trusted name in tree removal for Troutdale for more than three decades! We own our own delicate and heavy duty equipment, and our skilled tree removal professionals know how to utilize them. We have an on-staff certified arborist who is able to review the condition of your tree and advise on the best course of action. If you would like to keep a tree and it is possible to restore it to health, our arborist can help make that happen. In situations where it is not possible to save a tree, we are able to advise on the situation whether you use our tree removal service or not. There are many reasons people need tree removal. You may be building on a lot that needs to be cleared, you may be going for a specific landscape design, or creating a field space for your children to play. Whatever the reason, our tree removal technicians can help with the entire process, from planning to implementation. We can get rid of trees that have become a threat of falling on buildings or are growing too close to power lines. We find the best way to remove the specific trees that are necessary for your project. Be sure to add our stump removal service to ensure we completely clean the area of all tree debris before we leave. 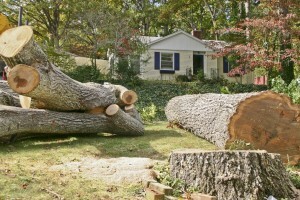 Emergency tree removal often becomes necessary during or after a large wind storm. Large amounts of rain can also loosen the soil and cause a tree to begin to lean. When a tree has become a threat to your home, business, vehicles, power source, or other structure or property, we offer 24/7 emergency tree removal Troutdale trusts to be fast and safe. We can eliminate specific branches that have cracked or take away the whole tree. If a tree has already fallen, we carefully remove it without causing any further damage. Commercial tree removal in Troutdale involves projects that are large-scale and generally include multiple trees that need to be removed. We can clear the land for you to build on or get it ready for whatever use you have in store. 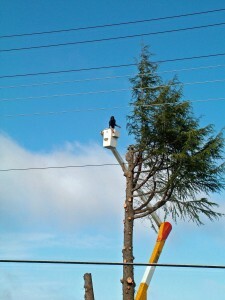 Industrial tree removal requires experience and planning. Knowing the best way to go about the project and having the knowledge of the right equipment is a must. Contact us when you need residential, commercial, or industrial tree removal Troutdale can rely on.